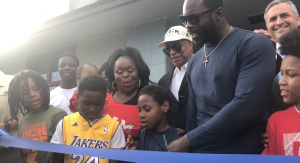 NEWPORT NEWS, Va. – Back at his old stomping grounds, Michael Vick took part in the unveiling of a newly renovated Teen Center at the Boys & Girls Club of the Peninsula. Last August, fellow Newport News native Allen Iverson donated a new basketball court to the same club. Iverson also frequented the club during his childhood days. “We understand what its like to be in the shoes of young kids that visit this Boys & Girls Club.” Vick, who is now a Fox Sports Studio Analyst, says this is just the beginning of what he plans to do with the club.